ATN NVBNB08XH0 NVB8x-HPT Night Vision Binocular FREE SHIPPING! ATN knows you want only the best when you're depending on technology to see and perform your duties in total darkness. That's what they bring to the table with all of their models, including the NVB8x-HPT Night Vision Binocular. 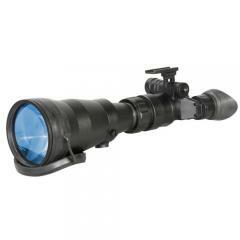 ATN's optics are all proshield multicoated glass for a high quality 8x magnification. This HPT generation binocular offers digital controls with auto brightness control and cut-off, an infrared illuminator and IR indicator, and a low battery indicator. NVB8x-HPT features weatherproofing, resisting water and fog, and will operate in temperatures ranging -40° to +50°C. ATN NVB8x night vision is MIL-STD-810 compliant and comes with a limited two year warranty. DImensions: 315 x 108 x 102mm / 12.4" x 4.3" x 4.0"
©2002-2019 CopsPlus.com: ATN NVBNB08XH0 NVB8x-HPT Night Vision Binocular FREE SHIPPING!